Organic Yarn, a real revolution, in progress. It's June of 2010, and who among us is not painfully aware of the tremendous impact we have on our world, or earth, our environment. Climate change is discussed in kindergarten, and school buses emit their nasty petrol fumes in a world where increasingly, we know that we need to do something about how we live on this planet, if we want to continue to do so. As Anne Budd says in her wonderful book, Knitting Green, there is no right or wrong. Or rather, that is not the discussion. The discussion is how we can become more aware of what even the smallest of activities can do to the world we live in. On the face of it, Knitting may not seem problematic, and once, it wasn't. 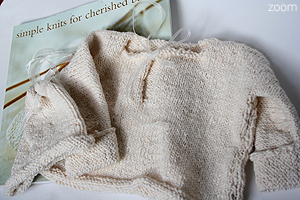 But as knitting has evolved into a force to be reckoned with, both with or hands and our pocketbooks, it becomes increasingly obvious that what and how we do and make with our hands matters. In other times, people knit with yarn they harvested, from their own sheep. We spun our yarn, and dyed it with locally available dyestuffs - berries, grasses, blood. And knitting was done at home, long after the light was gone and the candles were lit. The industrial revolution and our ability to manufacture almost anything has changed that. And it's changed the yarn we buy, and knit with. Huge commercial plants in far away countries employ thousands to spin and dye many of the commercially available yarns many know and love. The sheep never meet the carders, the carders don't know the dyers, and so on. And the yarn you knit with may be as far from it's origins as half a world. 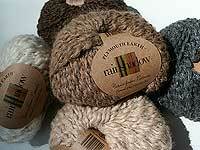 There are so many types of organic yarns that to list the types would take us ages. From bamboo to wool, a yarn can be defined as organic if it simply doesn't use petro-chemical dyes, or it can be uber-organic, and show the hand of someone nearby who made it. Not all of us have access to both kinds, nor the pocketbook to choose only one (yes, true organic, handmade yarns are usually more expensive - the sad but real fact of manual vs. machine labor, mostly). But simply being aware of the different levels of organic yarns can help us understand the contribution we all make to promoting a better way of being in the world. 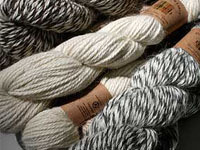 The Basics, the standards, the deal on organic yarn standards. Fiber in the US that is sold as organic must be grown according to USDA Organic Standars. Farmland is certified organic, and it must be accredited by a an organic third-party certifier. Organic cotton, in particular, is mostly grown abroad - but when it enters the US, it must meet USDA standards. Organic wool is particulary tricky. Organic wool comes in a variety of flavors - but the basics are that it must come from livestock and land that has been grown and raised according to USDA organic standards and certified, again, by third party organic certifying agencies. Federal organic standards DO NOT cover processing, but the industry has developed a set of voluntry standards, and yarns labeled organic adhere to these. The Global Organic Textile Standard (GOTS) is the gold standard for voluntary standards, and are followed by most fiber producers. You can tell a lot about how really organic a yarn is, sometimes, but how it feels? Organic yarn can be processed - does that make it less organic? That is a decision that you may have to make, and you may have to research the yarn you are interested in. Organically harvested yarn that is then chemically dyed with damaging dyestuffs - is that truly organic? The label may be on it, but it may not represent what you are truly interested when you say organic yarn - you may mean a low-impact, organic, low-process yarn. Does it have specks of hay, is it lanolin-y (the oil from the sheep?). Is the cotton overprocessed, mercerized? What does that mean in terms of how organic it really is? You'll have to decide what level of organic you are comfortable with, and whether or not you believe the label and the company making the organic yarns. Silk is a little tricky. There are different schools of thought - when you are about Organic, is that also about a PETA-like standard? Does it have to do with the way animals are treated in the manufacture of silk yarn? Are silkworks different from Sheep? Some knitters are like some vegans, and will not use a yarn that may have negatively impacted the animal. 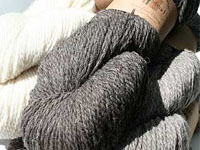 There are a few things you can find out about the silk yarn to find out if it is more organically produced than others. Is it wild, or tussah silk? This silk usually means that the silkworks are allowed to become moths and emerge from the cocoon - and the cocoon is then procesed. This silk is not as shiny as regular silk yarn, it has a different lustre, and a shorter fiber length. Regular, or most, of the silk we buy over the counter is made from cocoons whose pupae (the silkworm before it emerges) are destroyed just prior to the harvesting fo the cocoon and the fiber it is made of. Some are not worried that about 2500 pupae are destroyed to make one pound of silk. For others, its not an option. At fabulousyarn, we have both kinds: There is nothing like the beautiful japanese silk from artyarns and tilli tomos, but then again, we love the raw silk feel of Peau De Soie. You'll have to make your own choices about this - we'll be endeavoring to find more of the tussah silk this year, because we love both the lack of negativity, and the feel of it. You'll need to decide what level of organic, or impact, you need to support, or not support, in the world. Compared to the Gulf Of Mexico Spill by BP, the small amount of energy that it took to make one 1/2 organically harvest skein of yarn. But multiply that by, how many knitters are on ravely, and it becomes a little more clear how much we can impact our environment if even 1 in 10 of us decide to go TOTALLY organic, 2 out of 5 go for low impact organics, and the others simply stay local. Every single thought about it, and every effort, helps, so make your choices, and feel good about them.